Chicago, Ill. - The Chicago Blackhawks announced today they have acquired forwards Andrew Ladd and Matt Fraser and defenseman Jay Harrison from the Winnipeg Jets in exchange for forward Marko Dano, Chicago’s first round pick in the 2016 National Hockey League Draft and a conditional pick in the 2018 NHL Draft. Fraser and Harrison will both report to the American Hockey League’s Rockford IceHogs. Ladd, 30, was a member of the Blackhawks’ 2010 Stanley Cup championship team; he tallied 99 points (37G, 62A) in 184 regular-season games with Chicago and added 10 points (6G, 4A) in 36 playoff games. The Jets captain has registered 34 points (17G, 17A) in 59 games with Winnipeg this season, including an active three-game goal streak (4G) from Feb. 18-23; he has posted 143 shots on goal and 126 hits. The Maple Ridge, British Columbia, native registered a career-high 62 points (24G, 38A) in 81 regular-season games with the Jets last season. Ladd, who also won the Cup with Carolina in 2006, has recorded 454 points (202G, 252A) in 750 career NHL games across 11 seasons with Carolina (2005-08), Chicago (2008-10), Atlanta (2010-11) and Winnipeg (2011-16). Carolina’s first-round pick (fourth overall) in the 2004 NHL Draft, Ladd has notched 16 points (8G, 8A) in 57 career Stanley Cup Playoffs games. Fraser, 25, has registered 14 points (5G, 9A) in 44 games with the AHL’s Manitoba Moose this season. The Red Deer, Alberta, native has tallied 17 points (11G, 6A) in 87 NHL games across four seasons with Dallas (2011-13), Boston (2013-14) and Edmonton (2014-15); he added two points (1G, 1A) in four 2014 Stanley Cup Playoffs games with Boston. He has tallied 145 points (95G, 50A) in 225 career AHL games and added seven points (5G, 2A) in 14 Calder Cup Playoffs games. Harrison, 33, has recorded five points (3G, 2A) in 18 games with Manitoba this season. The Oshawa, Ontario, native has posted 75 points (23G, 52A) in 372 career NHL games across nine seasons with Toronto (2005-09), Carolina (2009-15) and Winnipeg (2014-15). He has added 117 points (37G, 80A) in 426 career AHL games and notched 20 points (3G, 17A) in 45 Calder Cup Playoffs games. Dano, 21, collected two points (1G, 1A) in 13 games with the Blackhawks and added 23 points (4G, 19A) in 34 tilts with the IceHogs. 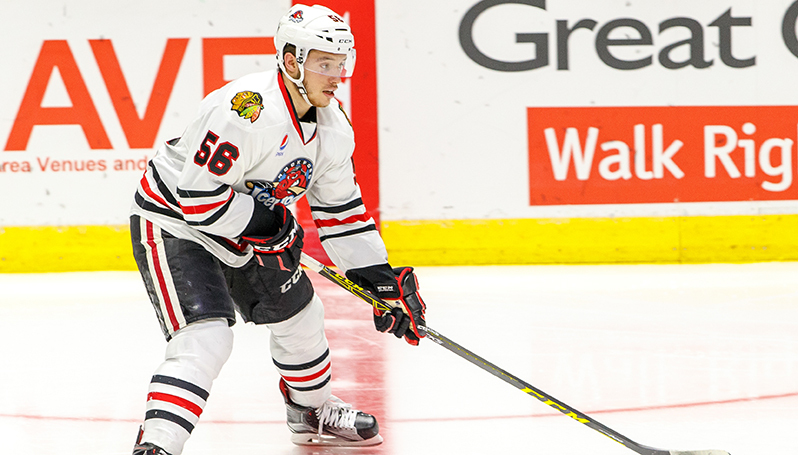 Dano led the IceHogs with a +17 plus/minus rating and his 19 helpers ranked third on the club. The Eisenstadt, Austria, native was acquired from the Columbus Blue Jackets on June 30, 2015.